This is a guest post from Alicia Jay, who I interviewed earlier this year. It’s my pleasure to host her here today! As a Virtual Assistant you are probably always looking to learn new things in order to grow and expand your business. I know that I am. Part of our job is to keep up with the latest information, news and training in order to best serve our clients. So, what does this have to do with general transcription? Well, everything! If it is not currently part of your service offerings then I’m going to suggest that you consider it today. It’s definitely a service that can enhance your business. Let’s dig deeper to find out why. If you’ve read this far and you’re interested in learning the skills needed to add general transcription to your business then I can help you! 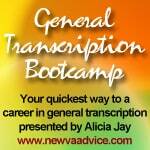 My General Transcription Bootcamp 6 week ecourse is scheduled to begin on January 14, 2013. I’ll teach you what you need to know in order to create perfect transcripts that your clients will love! Best of all, there is an early bird signup price if you register by December 15th! Click here to find out all the details. There are only 10 seats available so you might as well register now so you can cross it off your to-do list.